Who is Kirk Ferentz's agent? Seriously, whoever the genius was that structured Ferentz's contract for him better be well compensated by the coach. It's also pretty amazing that he doesn't represent every FBS coach in the country. Why, you ask? Because Ferentz has the greatest contract a mediocre coach could ever dream up. Why does that rank it among the worst? Because the schmuck at Iowa who actually signed this thing should be fired for incompetence. This contract puts the university at such a disadvantage, Iowa probably couldn't afford to fire Ferentz even if he was 0-12 every season and selling the team's equipment out of the back of his car on Sundays. 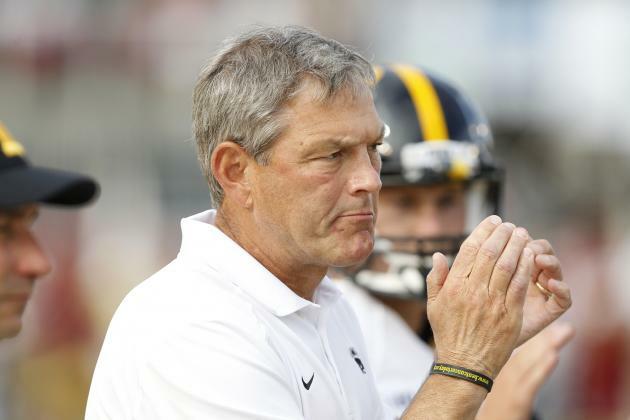 Ferentz, despite failing to ever win an outright Big Ten title (and not sharing one since 2004) and finishing the season with a ranked team only five times in his 14 seasons, signed an extension through 2020. Ferentz is also the sixth-highest paid coach in America (and second-highest in the Big Ten), making $3.9 million every season. He, like many coaches, receives a bonus for finishing the season ranked or winning a national championship. But Ferentz's contract doesn't require his team to finish the season ranked in a particular position. If his team is ranked at any point during the season in a particular grouping (Top 25, Top 20, Top 15, Top 10 or Top Five, he gets a bonus based on the highest ranking attained during a particular season—even if the Hawkeyes completely fall out of the Top 25 by season's end. Imagine Iowa is a preseason Top Five team. Then imagine the Hawkeyes fall apart and finish with a paltry 5-7 record. In that case, Ferentz still gets a bonus as for having his team ranked in the Top Five. Nice, huh? But there's one more kicker. Should Iowa want to buy out his contract, it will cost the university nearly $3 million for every season left on his contract! Should Ferentz be fired this season, Missouri would pay him over $17.5 million to not coach. SBNation's Peter Berkes put together a pretty entertaining list of things Iowa could buy instead of firing Ferentz. Included on the list: nearly 27,000 corn futures on the agriculture market, 2.8 million burritos from the popular Iowa City Pancheros, nearly 775 pounds of gold, 10 million cups of coffee and many, many other things. Is there any wonder why Ferentz's contract gets the nod as the worst coach contract in college football today?